eNETEmployer is perfect for small-midsize Canadian businesses with up to 500 employees. The program is used widely across Canada for thousands of payrolls each month. Base fee of $9.95 and $1.30 for each processed employee. eNETEmployer offers total employee management through a suite of online tools for Human Resource, Payroll, Employee Scheduling and Time and Attendance management. Use it to enhance your organization's workflow and help reduce the rising costs associated with employee management. With no more software backups and updates to perform, you simply have the convenience of calculating your payroll at a time that's convenient to you. Pros: I like that you can review your results easily before submitting the payroll. I also like that the results are accurate. Cons: I do not like that I have to wait after every keystroke for the computer to think. This is extremely irritating. I find it very difficult to change an employee from hourly to salary. The vacation gets messed up and I have need help every time to fix the errors. Still not clear on how to do this correctly. I also have the same problem when changing the vacation pay rate. I also do not like that in the earnings area there are several lines for an employee but when you go to the next screen, you no longer see the employees name. Overall: I really do not think this is the most user friendly system. 1) If you find the system pausing after each keystroke, then you may have the "Edit All" option activated for the screen and/or you may have the Edit Mode features turned on at all times. If the current table has many rows and columns visible, the Edit All and Edit Mode commands will use an increased amount of your system resources. These two options are best used when you have a limited number of rows only. 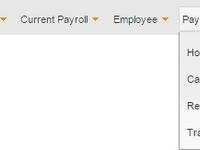 Edit Mode can be deactivated in the Payroll tab's Options screen. Edit All is button that appears above the table for all program screens. 2) When changing an employee from hourly to salary, you may find that using an employee template will help. Please contact me at the email shown below and I can walk you through the steps. 3) Can you elaborate on what you mean by "can no longer see the employees name".. I'm sure we can help. 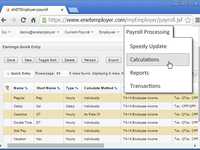 Pros: I like that it provides a secure on line way for me to deal with payroll. I like the end result. I like that I do not have to try to know all there is about payroll rules and regulations. I like that I do not have to submit deductions, it is done on my behalf. I assume there are checks and balances for verifying that my reporting and payroll entries are consistent and anomalies would be brought to my attention. I assume if my payroll was audited your system would live up to the scrutiny. Cons: I find that the program is not user friendly. The program is not intuitive to use. I have been using the latest format since it came out and I still do not enter the system feeling confident that I know what I am doing. I do not like the window for reports. I do not like how to pick the paydate and that it does not advance on its own to my next paydate. I do not like the layout and unless I hide alot of the columns it is impossible to see things at a glance. There is too much scrolling that needs to be done. There was one area that was not being done correctly on your end and I had to figure it out and inform your staff and I am not a payroll expert. Overall: The support people know their stuff. I have been pleased with support; however, I don't feel that I should need support as often as I do considering the amount of time I have used the program. 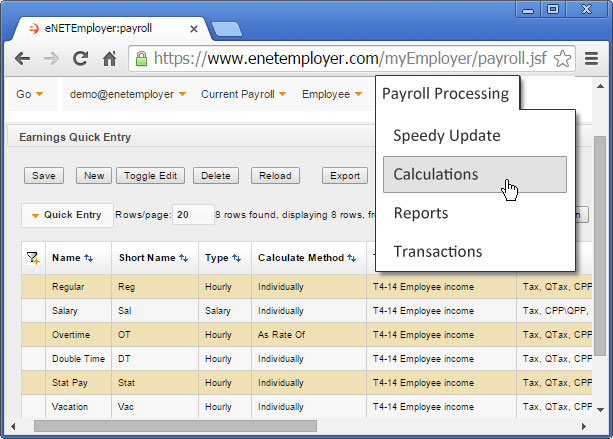 1) Yes, the eNETPayroll interface is quite different from the new eNETEmployer. While an overwhelming majority like the new spreadsheet approach, several users to miss the simplicity of the original look and feel. I see that you've already used the Customize View feature, but have you also "reshuffled" the columns (instead of just hiding the unused ones)? If you couple that feature with Filter on each screen, you should be able to arrange the screen and view exactly how you need. 2) Can you elaborate on the advancing pay date for the Reports screen? Currently, the program is set to advance to the next pay date automatically. Perhaps a setting or two has been adjusted and is preventing that from happening. Please email us at sales@canpay.com if you wish to discuss further details! 1) You can sort all relevant screens by alphabetical surname. Simply use the Filter feature on the desired column, and then use the Customize View button to Save the view. Now each time you revisit the screen, the filter setting will be retained. 2) We list current changes (and upcoming changes) in the Payroll News newsletter. Please subscribe today (it's Free) and you will see the changes that are planned as each issue arrives in your email Inbox. 3) Pay statements cannot be mailed automatically because the payroll admin needs to confirm that all of the pay run details are correct. Manual interaction is required in order to avoid errors being sent out automatically. Pros: I appreciate the customer support that is offered. I always have a response within 10 minutes for any questions I might have. Cons: At first I had some difficulty learning the new systems and procedures. 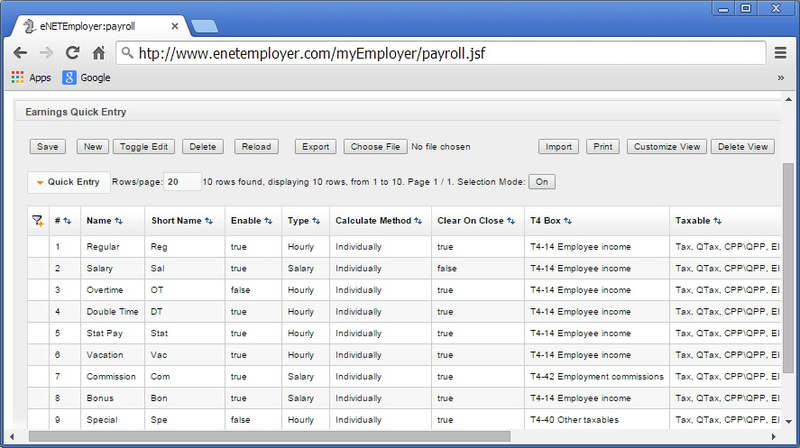 But now I realize just how intuitive the software is and can find any info I need for payroll quite easily. Thank you for your review and for your continued support of the eNETEmployer program. I'm glad you were able to learn the program eventually. To aid in the learning process for upcoming features, have a look at our online tutorials and video links. To do so, simply press the key from any program screen to view contextual help for the screen. Then use the Tutorials link to view step-by-step lessons for most program setup features. The videos on our YouTube channel will also assist. 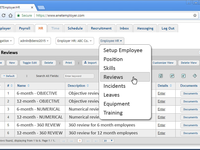 In addition to our Payroll module, we've recently launched a new employee recruitment/Applicant Tracking feature and hope to have our HR component ready for use in the near future. 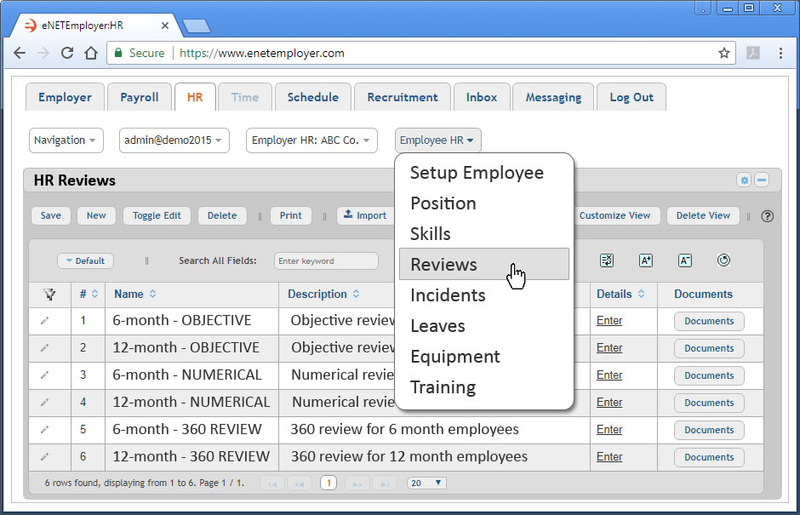 1) Instead of having to navigate through each of the first 6 screens under the employee menu, you can use the Customize View feature (in the Setup Employee screen) to show ALL of the columns. 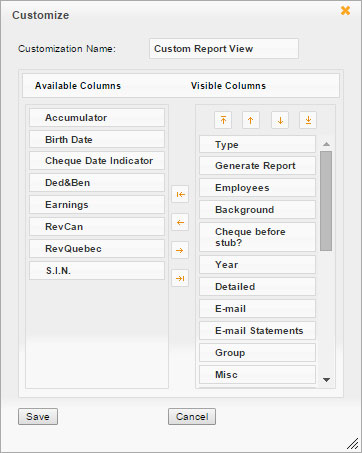 This customized view will show you all of the available columns that need editing in one easy screen. Pros: It was so easy to get set up and maintain. Cons: A bit difficult to use when viewing on my phone. Overall: I have saved so much time with payroll. The cost far outweighs my time! The staff love the direct deposit, and I love that I never miss a stat remittance deadline! So easy to use! Thanks for your review. I see the program is working well for you and that you have shared some good things. For the mobile issue, have you tried adjusting the text size using the Text View Icons that are located above each table (specifically, the icon that shows a capital letter "A" with a + sign beside it)? These icons are used to control the size and attributes of text in the data tables. For example, if you are working with a smaller phone or laptop screen, you can use these features to increase the size of your table text. Another good way to use the program on a mobile phone is to ensure that you tilt the hone sideways (landscape mode) - this will make all of the text and controls even larger. Pros: It is comprehensive and easy to use. It is user friendly and there is great support available. Overall: Payroll takes no time to process. Thank you for your review and for your continued support of the eNETEmployer program. I'm glad to hear that your payroll representative is able to provide the service and support that you need. For your reporting issue, could you share a few details about what you are looking to accomplish? eNETEmployer provides highly customizable reporting both from the Reports screen and via export from any other screen in the program. If you can share some details, we can show you how to gather the data you need. once used to the 'kinks', it is relatively easy to use. I have used one payroll system or another for over 20 years with little or no issues. This one is far from my favorite. It's just too cumbersome. I needed plenty of help in the setup. Overall: this program keeps overhead costs to a minimum; for a small number of seasonal employees, it is the perfect way to keep staff paid correctly, with T4s provided on time. 1) For easy setup, many customers use the online tutorials and video links. Simply press the key from any program screen to view contextual help for the screen. Then use the Tutorials link to view step-by-step lessons for most program setup features. The videos on our YouTube channel will also assist. 2) To delete an employee that has no data (assuming they have not yet been calculated), use the Employer tab's setup Employee screen. This screen shows the "employee pool" and provides a list of every person in the system. 3) To simplify each screen (make them less wide), use the Customize View button to hide columns that you don't use. Then the table will only show the fields and cells you need. Pros: The fact that you do ROE's and T4's and summarize hours is great. Thank you for your review and for your continued support of the eNETEmployer program. Cons: Way, way too complicated for my small business. The software is not user friendly at all and seems more like an interface for Canpay and not the client. It is very slow at responding to input and I'm always waiting for the software to catch up. This would be very difficult to teach to a new employee. Overall: Great customer service, terrible software. 1) The spreadsheet interface is by design. It allows you to customize your view exactly as needed. If you use the Customize View button, you can hide as many columns as needed so that the table will only show the fields and cells you need. 2) Like all internet-based applications, the speed is partially dependant on your internet line. If you are running a high-speed connection, you should see smooth program operation. Can you tell if the slowdown is more apparent at a certain time of day? We employ a dedicated high-speed fibre optic line and are currently meeting and exceeding the required bandwidth for the program. 3) We have numerous online and video tutorials to assist with learning the program. Have you visited our Youtube channel? Pros: It has become relatively easy to use now that I know how it works. I was an adjustment for sure, going from eNETPayroll to eNETEmployer but I'm overall pretty happy with it. Cons: The 'reports' page can be a little difficult to maneuver. Trying to figure out which reports I needed right away was a bit of a challenge. And overall, the web page is usually very slow to load. 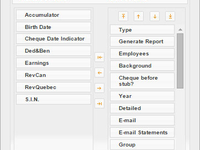 1) Each row in the Reports screen can be customized and saved for future use. An easy way to see if a report is relevant to your payroll, is to simply add it to the table and then run the report to review it's data. If you see that it is not relevant, simply remove the report row from the screen and you need never see it again. Pros: set up for our Home Hardware store - easy to use - great phone support from everyone. information available when needed and t4 remittance all done etc. We've recently launched a new employee recruitment/Applicant Tracking feature and hope to have our HR component ready for use in the near future. Overall: Find it very easy to use - quick and accurate ! Pros: One the things that I like most about using eNETEmployer is the flexiblity of time. I can do it at my pace, and at my free time. Cons: Using the software, of course, comes with a learning phase. After learning more of the features, the one thing that I still have a hard time with is paying our salaried staff their vacation time. I find that there are alot of steps to get this done. Overall: I have not had any negative issues in dealing with eNETEmployer, whenever I have an issue, my problem is addressed promptly. For the vacation time issue, I would love to hear a few more details about the method you are using. Perhaps there's a simpler way that we can discuss to shorten this procedure. Pros: Easy to get around the different aspects of the software. Cons: Not much if anything to complain about at all. Overall: LOVE THE CUSTOMER SUPPORT. Cons: I like all of it, but if I had to pick something it would be hard to do. Cons: No real complaints or concerns at this time. Thank you for your review and for your continued support of the eNETEmployer program. So glad to hear that your payroll representative is able to provide the quick support and service that you need. Pros: Ability to deposit up to three bank accounts per employee, flexible. Cons: Very,very slow - takes forever to add an employee and update. 1) Like all internet-based applications, the speed is partially dependant on your internet line. If you are running a high-speed connection, you should see smooth program operation. Can you tell if the slowdown is more apparent at a certain time of day? We employ a dedicated high-speed fibre optic line and are currently meeting and exceeding the required bandwidth for the program. 2) When adding an employee, is it possible that you have the "Edit All" option activated for the screen? If the current table has many rows and columns visible, the Edit All command will use an increased amount of your system resources. Edit All is best used when you have a limited number of rows. Pros: Easy to use. The software gets easier with every update. Take me about 10 minutes with 6 employees. Cons: Lots of pressing the save button, that cannot be a bad thing. Overall: They have solved all of my payroll problems. Cons: THERE REALLY ISN'T ANYTHING I DON'T LIKE. Thank you for your review and for your continued support of the eNETEmployer program. Glad to hear your support representative is providing you with excellent service! Please email us at sales@canpay.com if you wish to discuss further details. Pros: Easy and reliable to use. Works well with our bookkeeper too! All around good! Cons: No complaints. Our bookkeepers have been very satisfied. Overall: Great. Customer Service has been great with Lise and so far so good with Suzet! Pros: I always received answers to my questions right away. Cons: I had to go through a few different people to run my payroll but they handled it very professionally. Overall: They were able to take good care of my payroll for me so I could run my business with better focus on my job. Thank you for your review and for your continued support of the eNETEmployer program. Glad to hear that your new payroll representative is able to provide the service and support that you need. Pros: Payroll takes very little time to do now. Cons: I have had trouble getting the group benefits to change, but it's more of a me problem. Cons: Navigating is difficult. One has to go back a forth between pages. You cannot see everything but have to scroll to the right to check information then scroll to the left. Adding ridiculous lines. It just is not time efficient. 1) 1) To aid in the learning process, many customers use the online tutorials and video links. Simply press the key from any program screen to view contextual help for the screen. Then use the Tutorials link to view step-by-step lessons for most program setup features. The videos on our YouTube channel will also assist. 2) To avoid having to scroll to the right for wider pages, have you used the Customize View button to only show the columns that are relevant to your payroll? You can hide unneeded columns, and you can "reshuffle" the columns as well. If you couple that feature with Filter on each screen, you should be able to arrange the screen and view exactly how you need - no more scrolling. Cons: I do not have many complaints. If I ran into issues then I would call customer service and get help. Pros: Easy to use, very quick, and good support. Cons: I would say nothing. I like the software. 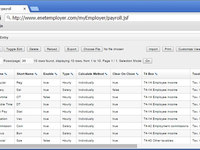 Comments: We've used two other payroll companies and an inhouse software program before trying eNetPayroll. We decided to try Home Hardware's payroll program and we haven't looked back since. Easy to use, excellent customer service. If we have questions or problems, we phone Tina at Head office and she helps us out. If Tina is not available, I call the eNetPayroll company itself and they help me out. No more stress, our employees love having their paychecks deposited in their accounts. They also like knowing ahead of time what is going into their bank account because the paystubs are emailed to them. Can't say enough good about this company and this program. It is more often than not just too slow.